Eclectic, funky, and oh-so-tasty, Ammazza is a welcome addition to Atlanta’s historic Old Fourth Ward. And this joint truly caters to its neighborhood. Just a stone’s throw from Sister Louisa’s Church, Noni’s, and other late night hot spots, Ammazza is open until 2 a.m. on the weekends catering to hungry pizza lovers. The definition of “Ammazza” can take on several different meanings in colloquial Italian. It’s an exclamation which can be taken both in positive and negative connotations. It’s not-so-pretty translation means “to kill” or “slay”; although it’s positive exclamation means a pleasant surprise such as “oh my!” or “gooddness”. Ammazza’s proprietor Hugh Connerty recounted a story of walking through Italy while formulating his game plan for the restaurant, he would hear local guys shouting at a woman if they liked the way she looked. A local Atlanta lady with Italian roots sent a nasty-gram to Ammazza before its opening denouncing the restaurant because of its negative connotation. She is certainly missing out. Ammazza sources their meats from Spotted Trotter and goodness we’re glad they did. If y’all order the Magherita pizza, then add bacon. Each slice has about an inch of crisp bacon topped on the fresh mozzarella, tomato and basil. Oh, and Ammazza makes all their own cheese in-house daily, in addition to their dough. They’ve got a good thing using the finest fare available in Atlanta. A fully stocked bar in the dining room offers a wonderful cocktail list, as well as an additional ordering point so y’all don’t have to get back in line out front. After ordering, pickup your own plates, napkins, utensils, etc. before finding your table. Servers circle about to provide assistance where needed. The dining room with it’s copper lights glowing against deep green walls provides a cool yet romantic ambiance. DJs are spinning nightly, but before the party goers head out for the night, Ammazza is very kid friendly. There’s even a concoction on the menu called “Glitter Pizza”. 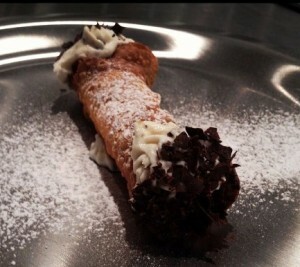 And the desserts offering is oh so sweet, including cannoli and a flour-less chocolate cake. 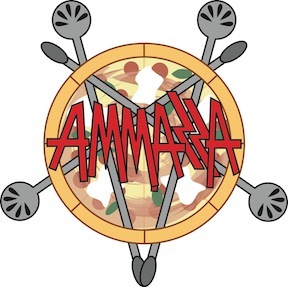 For more information, check out Ammazza’s website. Also, Like them on Facebook and Follow them on Twitter. While y’all are at it, Like Pretty Southern and Follow us on Twitter too.